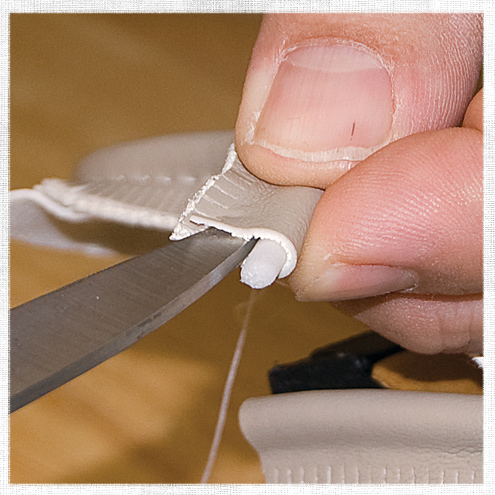 Trims & Cordage | Do-It-Yourself Advice Blog. Quick Tip: How Much Fabric Do I Need to Make Piping? Custom piping is a great way to give your cushion, pillow or chair a professional, finished look. It’s not hard to make, but it can be tricky to figure out how much extra fabric to order to accommodate the piping. Luckily, it’s not a complicated process (just two steps!) and we even have a chart to make things extra easy for you. The first step to determine how much fabric you’re going to need for custom piping is to determine how much piping you’ll need. You’ll want to know the measurement of the perimeter of your project. Then add a little extra, just to be on the safe side. This is the amount of piping cord you will order. At Sailrite, we have three sizes of piping cord to choose from: 5/32”, 6/32” or 1/4” diameters. Once you know how many yards of piping you’ll need you can use this handy chart to determine how much extra fabric to order. This chart only displays approximations for the most common piping diameter, 5/32”. Fabric estimates would be greater for larger diameters. The chart displays how many yards of 5/32” piping 1 yard of fabric will create in both bias and straight cuts. You can also use the Sailrite Fabric Calculator to help you plan your required fabric yardage for your next project. 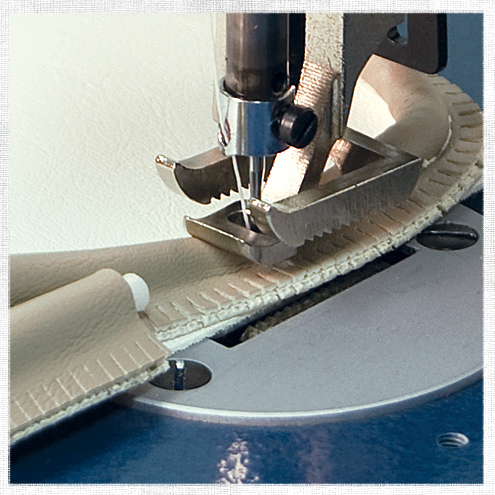 The Fabric Calculator will also offer suggestions for binding or piping measurements. You’ll notice that the calculations there are higher than in the chart above, but that’s because the Fabric Calculator assumes cutting 2” strips for piping. For more tips about making your own custom piping, check out our posts on 4 Steps to Custom Piping and How to Join Piping Ends. Find everything you need to create custom piping as well as a pre-made piping by Sunbrella, Naugahyde, and Classical Elements at Sailrite.com. Do you make custom piping for your projects? Do you have any tips or tricks of your own for ordering the right amount of extra fabric? Share your ideas in the comments! Adding piping to the edge of a cushion or pillow project is a great way to take the style to next level. However, sewing piping on so it looks just right can take a little bit of practice. The aspect of sewing piping that we get questions about the most is how to join the ends together so the piping still looks nice. Today we’re going to go over our method for joining piping ends step-by-step. This method is great for piping you make yourself with an outer fabric layer or for prefabricated piping like our Deluxe Vinyl Piping that has an inner cord. The method for finishing the ends of decorative piping trim and lipcord is a little different. You can see an example of that in this Chair Pad video tutorial. 1. 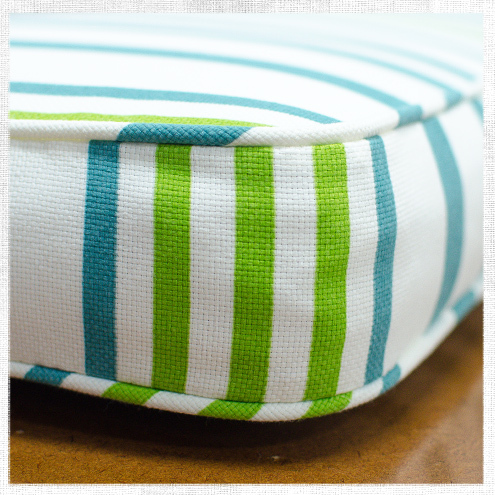 Since you want the piping to join at the backside of your cushion, start your piping at the back of the cushion plate about 2-3 inches past the center point. Leave 4-5 inches of piping unsewn (like a tail). This will make the piping easier to join at the end. Sew all the way around the cushion plate and stop just a few inches short of the center where you started. 2. 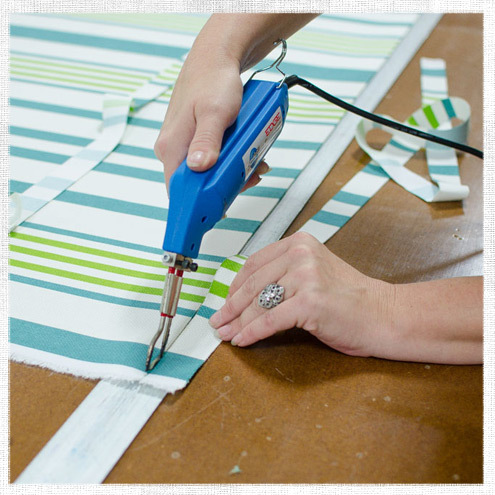 Carefully peel back an inch or two of the covering on each piping end, cutting any seams or peeling apart glued fabric. The exposed piping cord should overlap when laid down. 3. Lay the cords side-by-side and as flat as possible. Snip both the piping cords (not the fabric covers) with one cut so that the ends will be completely flush with one another. 4. Trim away any excess fabric, so that when the fabric from one end of the piping is wrapped around the other the fabric will only overlap about a 1/2 inch. 5. Match the tails of the piping cord up as closely as possible and fold the longer fabric end over the other. 6. Sew the piping closed, making sure your stitches overlap with your initial stitches at both ends. Be sure to bar tack to lock your stitches in place. And that’s it! Now you’ll have a nice subtle overlap at the back of your cushion and beautiful trim all around. To learn more about adding piping to your project and to see this process on video, check out our Learning To Sew Series Part 6: How to Add Piping. You can find great fabrics and decorative piping for your next sewing project at Sailrite.com. 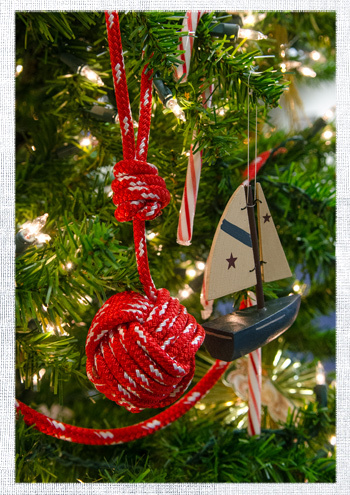 Yesterday we shared tips on how to give your Christmas tree a nautical flair and today, as promised we’re back to show you how we made our monkey’s fist knot Christmas tree ornament. A monkey’s fist, or monkey’s paw, knot resembles a bunched fist or paw and is used as a weight at the end of a heaving line and as an ornamental knot. The monkey’s fist as decoration is growing more and more popular both in and out of marine circles. With its rising popularity, we thought a monkey’s fist would be a fun, different way to accent our nautical tree this year. There are many different methods to tie a monkey’s fist. We’re going to show you one method but you can use these basic principles to customize your own. Often a weighted sphere is placed in the center of the knot to support the shape and to help with throwing. We used a Ping-Pong ball to hold the shape in our knot, but you could use any small sphere, knot the end of the line and place it inside the larger knot, or use nothing at all. At the end, we finished our monkey’s fist with a modified hangman’s knot so it has an adjustable loop for displaying on the tree. When monkey’s fists are used for heaving often both ends of the rope are left free and the fist is used as part of an eye splice. Watch this video to see step-by-step how to tie a monkey’s fist knot. Quick Tip: Be sure when you’re wrapping the rope around, that each strand sits next to the one before it without overlapping. You can find all the materials needed to make your own monkey’s fist, for hauling or decoration at www.sailrite.com. What do you think of monkey’s fist knots as decoration? Want them all over your Christmas tree or better left at the boat? Share your thoughts and opinions in the comments! When it comes to replacing the lines and rigging on and around your boat, the amount of choices can make your head spin. We’ve found that the best approach to deciding on new rope for your boat is to take the process one step at a time. First, think through your priorities for your line and your new rope’s desired characteristics. Then, look at the material and construction that meets those criteria and fits within your budget. Then all that’s left is determining size and amount. Let’s take a look at how all of those elements break down. To determine what priorities you need for your rope you’ll need to think about the rope’s application, what type of sailing you do, and your budget. Application: The application in which the line will be used is obviously a big factor for which type of rope you should purchase. The application will help you determine which rope criteria (strength, stretch & UV resistance) are your biggest priorities. Most rigging applications will require high strength and low stretch as priorities. Type of Sailing: Are you a racer or a cruiser? The main use of your boat will directly affect the main use of your lines. Racers will need lines that are lightweight and meet their class regulations, while cruisers may place more importance on longevity and ease of handling. Budget: It’s important to set a budget and to not overspend on your line. You could easily buy the most expensive, highest quality line, but for many sailors the fanciest line available is probably overkill. You might never use the line to its full extent, so it’s just not worth the expenditure. After you’ve determined the traits that will be your line priorities, its time to take a look at which fiber of rope will meet those requirements. Many of a rope’s performance properties lie inherently within its fibers. Here are the most common rope fibers and what they are known for. Polyester: An excellent choice for applications where strength, low stretch and durability are important, as in most running rigging applications. Also, polyester has a moderate price tag, which makes it a good fit for a variety of uses and users. Nylon: One of the original synthetic fibers, nylon has great shock absorption properties, wear and UV resistance, and strength. Also with a moderate price, nylon ropes are great for dock and anchor lines. Aramids (Kevlar or Technora): These high performance fibers feature very high strength and extremely low stretch. Aramid lines are perfect for serious racing sailboats and as running rigging on larger yachts. The downside to these lines is that they don’t have good UV resistance, can self-abrade, and are more expensive. HMPE (Dyneema): High Modulus Polyethylene (HMPE) is another high performance fiber with very high strength and very low stretch. These ropes also repel water, float, and are ideal for lightweight running rigging for serious racers or on larger yachts. HMPE ropes do have a few drawbacks, however. They have a low melting point, which makes these ropes susceptible to friction and when left under sustained loads HMPE ropes have been known to creep or elongate. Polypropylene: This is a lower to moderately priced line that is great for applications where a lightweight or affordable line is important. Polypropylene line floats in water and is a good choice for light air spinnaker sheets. The drawbacks to polypropylene are that is not very strong or UV resistant, has high stretch, and melts at a low temperature. Double Braid: A braided core inside a braided cover. This produces an easy to handle rope that is strong and durable. Double braid lines are used in running rigging and dock lines. Parallel Core: These lines have a unidirectional fiber core with a braided cover. Parallel core lines have significantly less stretch and greater strength than a double braid line of the same size. These ropes are ideal for halyards, sheets, and guys where low stretch is required. Single Braid: This type of line has a flexible and supple construction that absorbs twist and does not kink, making it great for mainsheets, furling lines, and large dock lines. 3 Strand: 3-Strand is durable, long-lasting, flexible, and easy-to-handle. Plus, this line won’t harden with age. Use nylon 3-Strand for anchor, dock, mooring, and tow lines or polyester 3-strand for running rigging on traditional cruising boats. The fiber and construction of the line can be selected in different combinations to best meet your needs. Be aware that the selection process often involves some trade-offs, whether they be performance or cost-based. Gauge your priorities to decide which combination would work best for your boat. Now that you have a good idea of what fiber and construction suits your needs, you should be ready to make your rope selection. 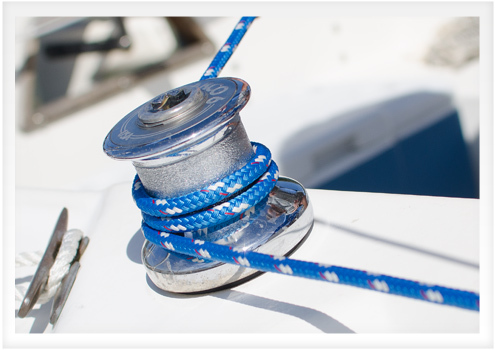 On our Rope Size & Selection Guide we have more information on rope as well as a handy selection chart that outlines our line recommendations based on application, type of sailing, and boat size. Sailrite stocks a wide array of high quality New England Ropes. See our full selection of rope for your vessel at www.sailrite.com. Is this the formula you use to select rope or do you use another method? Share your thoughts in the comments! 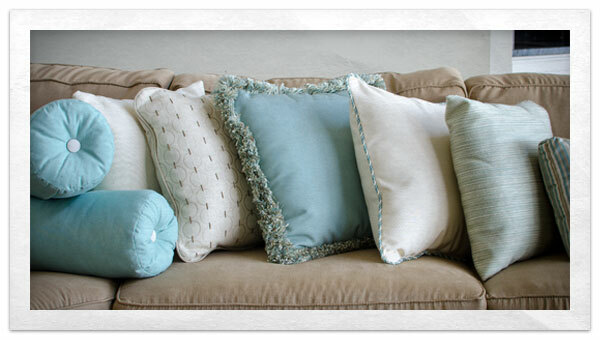 Accent pillows are a great way to accentuate the style and decor of your living room, patio, bedroom, or boat interior. They are quick and simple to sew and can be easily customized with decorative piping, fringes, zippers, and buttons in a variety of shapes and sizes. Pillows don’t require a lot of fabric and can be a great way to use scrap material. Sunbrella now has decorative piping and fringes that are a perfect match to their furniture fabrics! Watch these videos to learn how to use Sunbrella Decorative Piping or Sunbrella Decorative Fringes on your next throw pillow or upholstery project. We always recommend Sunbrella Furniture Fabric because it’s fade and stain resistant making it perfect for families, pets, and sunlight. Sunbrella Decorative PIping and Fringes also feature Sunbrella’s 100% solution-dyed acrylic yarns making for a beautiful long-lasting finishing touch to your pillows and upholstery. Browse our new selection of Sunbrella Decorative Piping & Fringes. 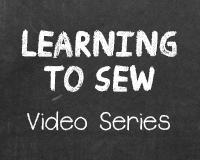 Face Slit & Bind Zipper Approach is the fifth video in our Sewing Zippers Video Series. The Face Slit & Bind zipper approach is a zipper installation method often used in an application where a removable backstay wire would need to protrude from a canvas bimini top. This zipper includes two sliders which would zip close around an object (a wire, rope or other) which exits from the zipper slit. 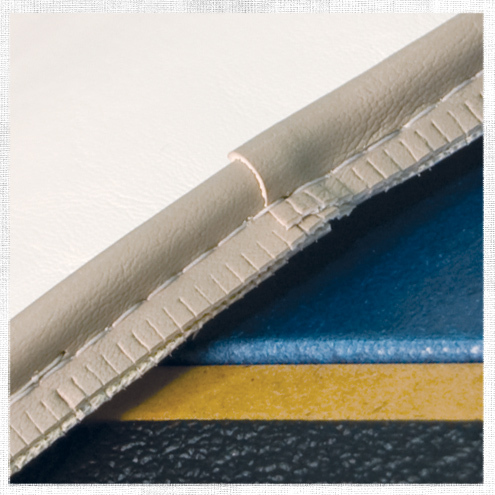 Watch this video for step by step instructions on how to install this type of zipper in your canvas or vinyl project. Zipper Plaque Installation is the fourth video in our Sewing Zippers Video Series. 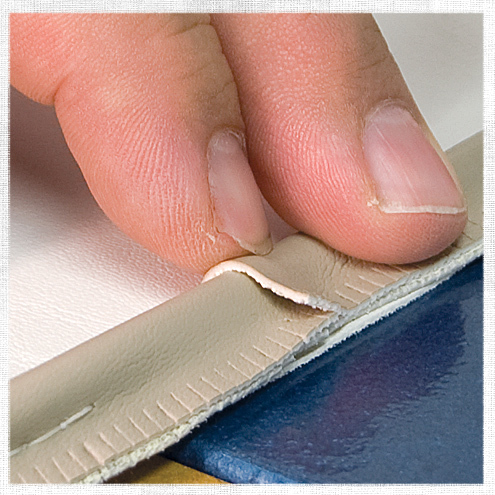 A zipper plaque is basically a zipper sewn on the box seamed edge of a cushion that is used to insert or remove the cushion foam. There are two different techniques for sewing a zipper plaque on a boxed cushion. 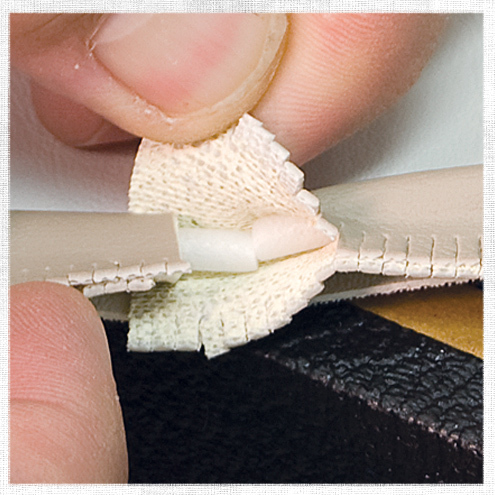 The first zipper plaque technique demonstrates a standard zipper plaque installation with a two hems that split in the center of the zipper. The second is a hemmed zipper plaque technique with a hem that covers the entire zipper. Visit www.sailrite.com for more project tips and all your cushion supplies.